I haven't had my car washed since before the Muffin Man was born. For those of you keeping track, that's almost three months of filth courtesy of the City of Angels. Today, as I was lugging the Muffin Man's carseat out to the car, I happened to brush up against the aforementioned grime. This wouldn't be much of an issue if I'd only gotten myself dirty, since I haven't showered since... I'm not sure when, but the brunt of the force was taken by the Muffin Man's portable Sleep Sheep. 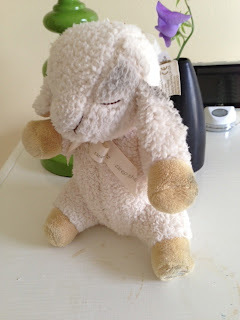 (Just in case you're one of my readers who still has a life and doesn't know what a Sleep Sheep is, it's this adorable little stuffed lamb that has a sound machine inside to help your little one sleep). In just the few seconds it took me to manhandle the carseat, I turned the Sleep Sheep into the Little Black Sheep. The Muffin Man loves his Sleep Sheep; so much so, that as soon as I put the carseat in the car, he shoved the dirtiest part of the sheep into his mouth and proceeded to ingest three months of pollution. Thankfully, he doesn't seem to have suffered any adverse effects (he's still alive, after all), though I'm hoping the black spit-up subsides before we go to see the pediatrician next week.